A major new money saving and environmentally beneficial smart kitchen app is due to be launched on the 2015 World Environment Day, Friday 5th of June. 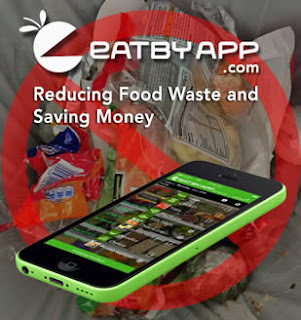 The hotly anticipated EatBy App has been tipped to become the must have app of 2015 as it promises to save it's users up to $1,000 every year and help reduce food waste. The staggering amount of wasted food has been widely covered in the press lately. Meanwhile the husband and wife developers of the EatBy App, Steffan and Barbara Lewis have been working on the EatBy project from their home in Scotland for over a year and a half. Their passion for finding a solution to the environmental issues surrounding food waste has grown since the project began. Barbara Lewis“We had the idea one lunchtime after we had to throw out the food we'd hoped to eat because it had passed it's use by date. That led to a purge of all the out of date food in our kitchen. And quite frankly, we were shocked and disgusted with ourselves when we realized how much we waste.” said Barbara Lewis. Over one year later and the app is ready for launch. It will be free to download and use with an optional shopping list that can be activated with an in app purchase. Recent reports state that the average household wastes $80 every month on un eaten food. With over 123 million U.S. households that's $9,840,000,000. With an equivalent amount in Europe, that's a staggering $236 Billion each year. It's known that about one third of all food produced is discarded. But the real cost is to the environment. This amounts to 1.3 billion tonnes of wasted food contributing 10% of greenhouse gasses. Steffan And Barbara LewisMany strategies for reducing food waste have been proposed by environmentalists, government agencies and industry specialists. 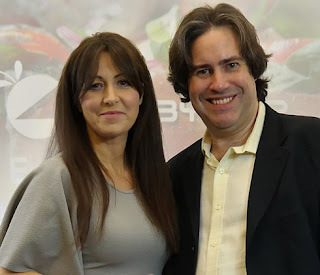 But the husband and wife creators of the EatBy App claim their app will be the first practical personal tech solution to the problem of food waste. It is a simple to use Smart Kitchen App that effectively helps manage the food in your kitchen and lets you know when food items expire. The optional integrated shopping list will also help reduce buying too much food in the first place. This is not a sponsored post-I received nothing for posting this. I do have an Environmental Science Degree so I thought everyone should know about this! !All opinions expressed are my own honest opinions. For more information please check my Disclosure Statement. Our giveaways are in no way sponsored or promoted by Facebook. What an awesome app! I throw away food all the time because we didn't eat it fast enough! I will definitely be downloading this!! Thanks for the awesome review!! Wow! This is a great app. How useful. Food waste is a big issue in this country. I am embarrassed by the amount of food I throw away. I think this app is definitely going to help me throw away less and save money. What an amazing idea! I am guilty of throwing away food and this would be a wonderful way for me to stop wasting food. Thank you! Definitely sounds like a very resourceful app! My family is bad about waste, so could use this! I have to say that I'm pretty good about not wasting refrigerated things but frozen and shelf stable items are a weak spot for me. I love this app! Well,this app could be very useful to me. Thanks for sharing with us! Wow! What a great app! I bet it will save families tons of money! How cool is this! I know we waste food. It's awful :( And we've tried hard and gotten much better about using it all...but it's still an issue. This app would be so helpful! Wow, this sounds like a great app. I need help in not wasting food! Its a shame when food gets wasted! Waste bothers me so much. I really hope people use this app and help curb the problem. This a a great idea! I am as guilty as anyone with this. I love the idea of not wasting food. This app is a good first step to trying to help out! What a great idea! Since I buy a lot of fresh produce I find myself throwing a lot of it aways. Will be downloading this one. This sounds like a great app. I know we throw away a lot of food. I would love to save some money. What a great idea. I hate wasting food! WE are trying so hard not to waste food but of course we do! It's pretty much unpreventable sometimes. We do try tho. Its hard not to waste. I think I need an app like this to help me. Wow I never heard of this app. Sounds great. This is the first I have heard of this app. It sounds really neat! Great for your pocketbook and great for the environment! What an awesome app. I really hate wasting food. I think my father would love this app. He is all about saving and not being wasteful. Great apps for father day gift never heard of it will have to look into. What a useful app. I'm sure we could use a little help managing our food inventory. This app sounds like a great idea. I had the same problem with surplus food before I started meal planning. Wow, I had not idea such an app existed. Wow, I'm going to check it out. This is an amazing app idea. I am always finding things in my kitchen that i have forgotten about. There is so much food wastage happening. Our main problem is I live in a home with people who do not like left overs, I end up eating all the leftovers until I can't stand to eat it for the umteenth time. If could get the rest of the family to help eat it, we wouldn't waste so much. I would really benefit from this. What a great idea for not wasting food. I need this app. I tend to cook a lot of food and throwing away bad food always makes me feel bad. I need this for sure and I have an android so I can use this right now. I am really excited about this one! This seams like a great app. I do throw out to much food. Could really use this, thanks. This is really interesting and useful! Definitely something we all can get on board with! How interesting! I definitely want to check this app out. It is really a travesty how much wasted food is thrown away. I'm glad that this is being brought into the forefront. I also love that this app is doing something to save the environment. I just had to come back to add that. A real must have app for each and every household. Imagine saving thousand of dollars while helping mother nature! Awesome! This is an app i would love to try. It is to easy to forget about things in the pantry. I will have to share this with my friends. I try my best not to waste food and get very irritated when waste could be prevented. I'll have to check out this app. What a great app! I really need to get it and I love that it helps the environment! We don''t want to waste, I would love to try this amazing app, it will really helps me thank you for smart idea. Wow, I could really use this app, we I am afraid to say throw a lot of food out. We shop way to much before the fridge gets low. Wow, this is really a useful app. I just have to make sure I add in the produce we have. This looks like a great app. Thank you for sharing, I will have to check it out. My kids are big food wasters so this app would be helpful for me. Kudos to the French. This app was a genius idea. We waste so much food in this country every day while people starve. That looks like a really cool app. I will have to check this out very soon. This app sounds awesome. I wish I had a smart phone. There are so many cool apps for them. Food is a big waste for me lately with my fridge on the fritz. It really saddens me. We started a compost pile because of it. I am saving for a new fridge. Hope to get one soon. I just installed the app. I know I've thrown away food sometimes but my family has reduced buying food we know we wont eat. I really love the idea of this app. I too have been disgusted with myself by the amount of food I have thrown out because it went bad before we could use it. So many people go hungry every single day, and here we are throwing food out. It's sad and it can be avoided. I have been thinking about this a lot lately, I hate how much food we waste but there doesn't seem to be an easy solution. This app sounds like a great tool to help you keep track of food in your fridge so you reduce waste. Can't wait to try it! hi, it's disgusting how often food can go bad in our home, and we do feel bad. this app is overdue, so glad it's available now.